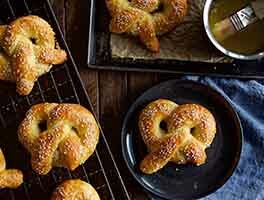 Soft pretzels are always a favorite. We've discovered that their distinctive texture and flavor also complements many varieties of sandwich fillings. In particular, we like these buns with a generous scoop of maple-mustard chicken salad. 1 hrs 57 mins. to 2 hrs 11 mins. Mix and knead the dough ingredients — by hand, mixer, or bread machine — to make a smooth, slightly sticky dough. Allow the dough to rise in a lightly greased bowl, covered, for about 1 hour, until doubled. Divide the dough into 10 pieces and shape each piece into a smooth ball. Alternatively, for instructions on how to shape long sub-style sandwich buns, see the tip below. Drop 5 dough balls at a time into the water bath. Cook for 30 seconds, flip over, and cook for 30 seconds longer. 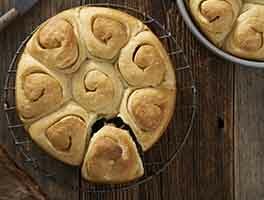 Using a slotted spoon, return the buns to the baking sheet. Using scissors or a sharp knife, cut 1/2"-deep crosses into the center of each bun. Sprinkle with coarse sea salt. Bake the buns for 20 to 24 minutes, or until they're a deep-dark brown. Remove them from the oven, and transfer to a rack to cool. Our easy pretzel mix makes wonderful sandwich rolls. Use the directions on the mix box to bring the dough through its first 30-minute rise. 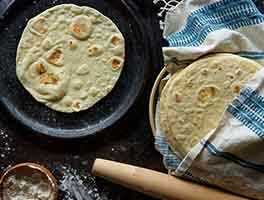 Divide the dough into six pieces and form them into balls, flattening them slightly so that they're more disk-shaped. Let the buns rest for 15 minutes, and prepare the water bath as instructed on the box. Place the buns in the water bath, and cook for 20 to 30 seconds on each side. Snip and salt the buns as directed in the recipe above. Transfer the buns to the well-greased cups of a hamburger bun pan (or a parchment-lined baking sheet), and bake in a preheated 400°F oven for 18 to 22 minutes, until they're a deep golden brown. Remove them from the oven and cool on a rack. Yield: 6 pretzel buns. These pretzels can also be shaped into long stuffed sandwich-style buns, perfect for grilled sausage with peppers and onions or brats and sauerkraut. After the first rise, simply divide the dough into eight pieces, shaping them each into a ball. Flatten the balls into 6" disks and roll them into logs, pinching the seam and ends to seal. On a clean, dry work surface (no oil, no flour), use two hands to drag each log toward you; the friction of the work surface should seal the seam and smooth out the surface of the bun. Let the buns rest for 15 minutes, then boil and bake them according to the recipe instructions, slashing them diagonally or lengthwise. Use our sub sandwich roll pans to ensure the bottoms of the pretzels stay crisp during baking. This recipe is delicious! The first time I made it, I had absolutely no issues. However, the next few times I tried it, the buns sealed themselves to the pan. I've tried using parchment paper sprayed with nonstick cooking spray but nothing seems to work. Any ideas why this might be happening and how to prevent it in the future? 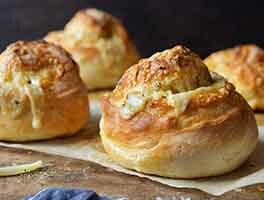 These are our favorite pretzel buns, but they aren't as fun without their crispy bottoms! One of my favorites. Easy to make and delicious. Especially tasty with tuna salad; though my niece makes a lovely turkey, green and red pepper, olives, pepper jack and Dijon sandwich! Love pretzel rolls but didn't try baking them until I moved south. I'm not the best baker but this an easy, reliable recipe. They also make unbelievable croutons (delicious in pea soup and pumpkin soup). Thanks for the recipe. 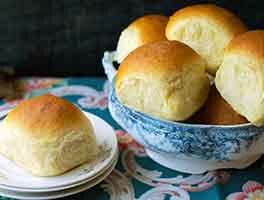 This is one of my go to roll recipes but I would like to add some sourdough starter into it. Any tips on if I need to cut back on ingredients or how I should go about adding the sourdough? Thanks! My go-to sandwich bun. These are easy to make, the recipe is straight forward and simple to reproduce, and they look great and taste even better than great. My only suggestion is to make the portion size bigger. The third time I made the recipe, I multiplied it by 1.25, which yielded about 1230 grams of dough (I have baked professionally so I always work in grams-the math is so much easier). All of my previous attempts have not given me big burger/Kaiser sized rolls, so I divided it by six, with each dough ball at 205 grams. Second rise looked great, poached just fine, sprinkled with a touch of Kosher salt, cut a cross hatch on top. Put them into a preheated 450 degree oven, immediately turned it down to 405, baked about 25 min. The six rolls I made are between4.5 and 5 inches in diameter. Made BBQ pulled pork sandwiches out of them. Just heavenly. Thanks so much for the recipe. Somehow I managed to mess these up. I have never had any issues with KAF recipes before (or with bread baking, for that matter). The first rise went just fine--doubled in bulk in about an hour. However, the buns on the second rise just kind of flattened out. I had hoped the water bath/baking might give them some more elevation, but sadly it was not enough to compensate. I weighed all my ingredients on a kitchen scale, but the dough did seem slightly sticky. Maybe the scale is broken?? Help! 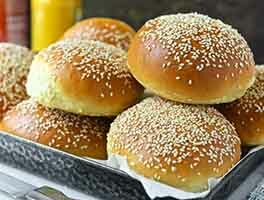 These buns are absolutely delicious. Everyone that eats them loves them. When I use them for burgers I make 10 buns, but when I use these buns for other sandwiches I make 20 smaller buns. I think it should be noted on the recipe though that these buns should be made on the day you plan on serving them. While we still eat them the next day, they become a little moist. With the exception of salt, which I reduced by 1/4 teaspoon (my doc would be proud), I followed the recipe exactly. I flattened the balls, which I very strongly recommend against-but the taste is heavenly. I will say that it was somewhat difficult to flip over in the water bath, but next time they won't be huge flat dough and perhaps more manageable as a ball. Live and learn. I didn't get all the flour in-maybe low humidity? I will make these again. I printed the recipe so I could use some of the tips other bakers suggested as well to remind myself not to flatten!